People may laugh when they hear a Monkees concert? 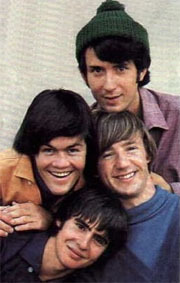 But The Monkees are probably the most under rated, disrespected rock & roll band of all time. Many like me grew up with their TV show in the early seventies (second generation in reruns). In 1967 the Monkees TV show was groundbreaking, in the style of the Beatles; A Hard Day’s Night comedy /rock, the Monkees conquered the television market. Their show broke into the main stream, on at prime time (7:30 PM) the so called “younger generation” hit main stream America. They also introduced “the romp”; which is what developed into music videos. 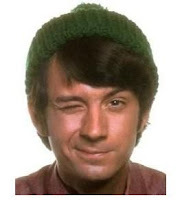 Each week a Monkees song would be played over a montage comedy skit or a scene where they performed the song live. Most of the rock groups & hipsters of that time loved & respected what the Monkees did for the generation. As for the music, their first four albums went to number one, The Monkees (October 1966) & More of the Monkees (January 1967) went five times platinum. Headquarters (May 1967) & Pisces, Aquarius, Capriron & Jones (November 1967) both went double platunum. They had three number one songs & six top ten hits from 1966-1968 & actually were the top selling artists of 1967. As kids, my generation first enjoyed the zany antics of Mickey, Davy, Peter & Mike, then as we got older we started noticing the pretty the girls in bikini’s on their show & the music. John Lennon said of the Monkees back in 1967; “They’ve got their own scene, and I won't send them down for it. You try a weekly television show and see if you can manage one half as good!” he told them “I think you're the greatest comic talents since the Marx Brothers. I've never missed one of your programs." CONCERT REVIEW: All roads leading to the Westbury Theater were flooded with a lot of detours on Friday night, making it a close call in getting to the show on time. In any event we made it with seconds to spare. The Monkees were fantastic, a wonderful night of nostalgia, sixties music & some comedy. I thought there were a few times; especially early on that they struggled to get going, but the tight stage may have had something to do with it. I was more surprised how some of the less popular songs went over, notably the set from the movie “Head”. By the last segment of the show everyone was up on their feet singing & clapping along, having a ball! We had good seats about 10 rows back, which helped me take the good pictures. As for the sound, at times I thought some of the over head sound system got lost in the mixing, but that’s the effects of a Theater in the round. The small stage was filled with a seven piece band behind the three Monkees, there wasn’t much room to move but they adapted well with the surroundings as the show progressed. Their backing band were pretty good (nothing spectacular) but good enough to play the two hour, fifteen minutes without a break. They began with a medley of Monkees songs that would be played through the night. There were four video screens, showing clips from the old Monkees TV shows, the movie Head, & photographs all through the concert. It added a great nostalgic background to the music. Then the three Monkees hit the stage to a huge ovation. They still have their sense of humor, cracking little one liners, while playfully bouncing their slapstick comedy off each other. Davy said as the show began, “I’m Davy Jones father, Davy will be out a little later”. 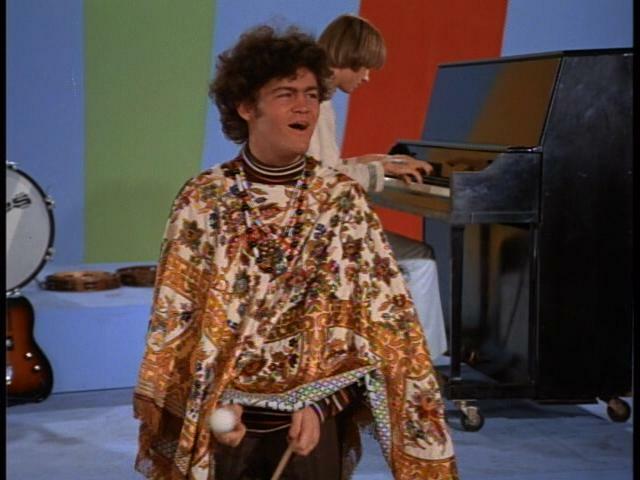 Mickey Dolenz was dressed in black jeans & black button down shirt over a black t shirt with a design on it. He donned a black fedora hat (later a beige one) covering his balding head. He looks good & still has the energy along with that Dolenz sense of humor. His voice was pretty much right on most of the time although he did struggle with a few songs. He sang lead vocals on his songs, backing vocals on others, played drums & tambourine. He told one story about how the Beatles threw a party for the Monkees in London in 1967. It was at the height of physchedelia & the Beatles were making Sgt. Pepper. The Monkees got to sit in on some of those sessions & Mickey heard a preview of Strawberry Fields /Penny Lane from Paul McCartney, two weeks before their release. Mickey said he wrote “Randy Scouse Git” from that experience. 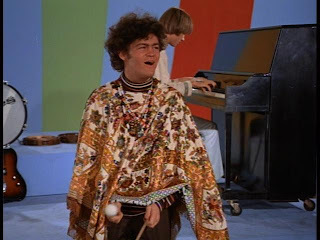 In the 1966 Monkees TV show romp for the song, Mickey is scene in complete hippie regalia with a colorful poncho, love beads, & permed hair. Another Dolenz story told how he & Davy were driving in their ’66 Mustang convertible totheir Hollywood home when they first heard “Last Train to Clarksville’ on the radio. They knew they arrived! 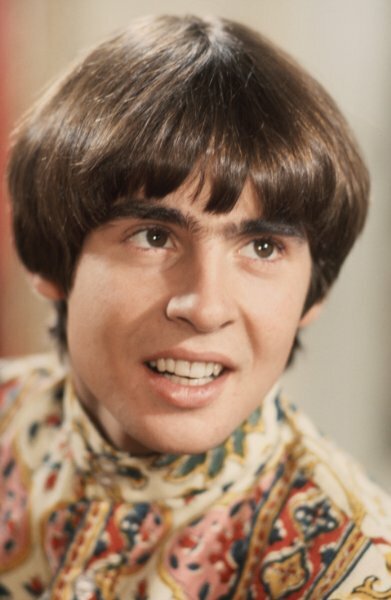 Davy Jones is still good looking & still short (a bit of Monkees humor there). Davy was one teen idol I never disliked & always thought was a kool dude. The girls (now women) still love him too, especially when he does his famous sliding dance moves. His voice sounded great although, I thought he was changing some of the singing style on a few songs early on. But he was phenomenal on “Daydream Beliver” “Little Bit You” “She Hangs Out” & “I Wanna Be Free”. He sang lead & backing vocals as well as played his tambourine. He made his usual wise crack jokes in the background as if it were 1967 again. He told one story about how on each episode they would have him fall in love. Then a montage of pretty girls from his romances on the show, were played on the video screen. He later said, that on the show, they weren’t allowed to talk about any of the controversial issues of the sixties. He stated how important of a song “I Wanna Be Free” was then & still is today. He also did a fine dance number, to “Daddys Song” (from Head) in a white tuxedo complete with tails outfit. (Remember he was the original Artful Dodger in the classic play Oliver . in both England & on Broadway. Did you know he was on the Ed Sullivan show with Oliver’s cast the night the Beatles first preformed!!). Peter Tork the true musician of the group is still the truest hippie of the band as well. His zany humor is still intact, but let’s also give him his due as the best musician on the stage! He played keyboards, piano, guitar, banjo, French horn, percussion & sang vocals. He wore a kool red velvet shirt tied criss cross on the the chest with black pants buttoned along the sides. Tork is still funny, one of the highlights of the night for me was his version of the great “Auntie Grizelda”. He also did a great job on vocals, singing his & a few Mike Nesmith songs, most notably the county western “What Am I Doing Hangin’ Round”. 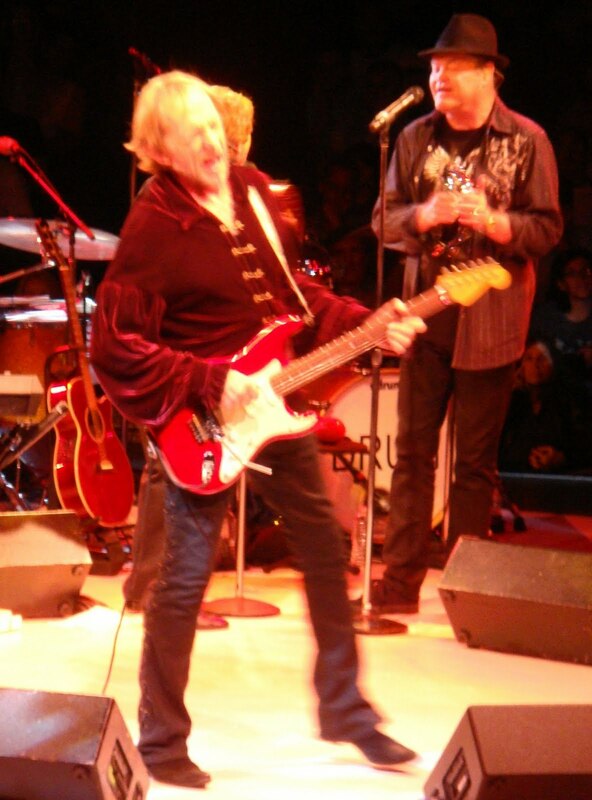 Other Peter Tork musical highlights were the psychedelic “Shades of Grey” & “Can You Dig It”. It was a great night for nostalgia, a great night for good sixties music & great night out. Seeing the Monkees made me feel a bit younger as they took me back. To see them still going and able to do it so well is an inspiration. I was/am a fan of the TV show, I went to the 1980’s reunion Tours, I have Monkees collectibles (the DVD box set, trading cards, books) & I’ll be there for the next tour as well, thanks guys. Great. Great. Great. Loved the post. Loved the Monkees. Thanks for starting my day with great memories and songs! We saw them in the San Franicsco Bay area Sunday and thought the review here was right on! It was a fun and nostagic evening for this 54 year old rocker I bought a Monkees tamborine with the cool Monkees guitar logo.